Handy Andy's Quality Vacuum Cleaners has been in business for over 60 years since 1959. We sell, service and repair all brands of vacuum cleaners and sell parts for all models. We also make the best new vacuum cleaner you'll ever own, our Handy Andy's Quality Vac™ Vacuum Cleaner brand. Our showroom is the largest around with more than 80 different model vacuum cleaners including all famous advertised name brands. We'll be happy to assist you in finding a vacuum to suit your needs and stand behind your purchase and cover any service required under the manufacturers warranty. You can plug in vacuums and try them out in our showroom and compare! We have nearly every kind of vacuum cleaner on the market. To be able to see so many brands and types of vacuums in one place and have all your questions answered by an expert is worth a visit to Handy Andy's. More and more of our customers come to us looking for a better vacuum and we have been listening. They want a vacuum designed with features that are truly useful like automatic carpet height and floor cleaning, clean air, easy pushing, deep cleaning for sand and pet hair, plus an extra long cord and suction hose with tools for easy floor to ceiling cleaning including stairs. The vacuum must be built to last and easy to maintain not like "throw away vacuums" sold through hyped up infomercials that customers struggle with and need to replace every year. We responded to customer needs by building our own vacuum, the Handy Andy's Quality Vac™ Vacuum Cleaner, and doing it for over 32 years. Handy Andy's is famous for quality and service and it's built into every one of our vacuum cleaners. We invite you to come in for a demonstration of our most popular vacuum cleaner. Our Handy Andy's Quality Vac™ Vacuum Cleaner has been so successful, we sold more than 8,500 vacuums since 1987. You'll love our Handy Andy's Quality Vac™ Vacuum Cleaner more than any other vacuum you ever owned and our guarantee and service is nothing short of amazing. Our customers are so pleased with the performance of their Handy Andy's Quality Vac™ Vacuum Cleaner and the service we provide, we are referred and recommended by our customers all the time! Our customers are very loyal and we thank them for their repeat business. It's the very reason we've been in business for over 60 years! 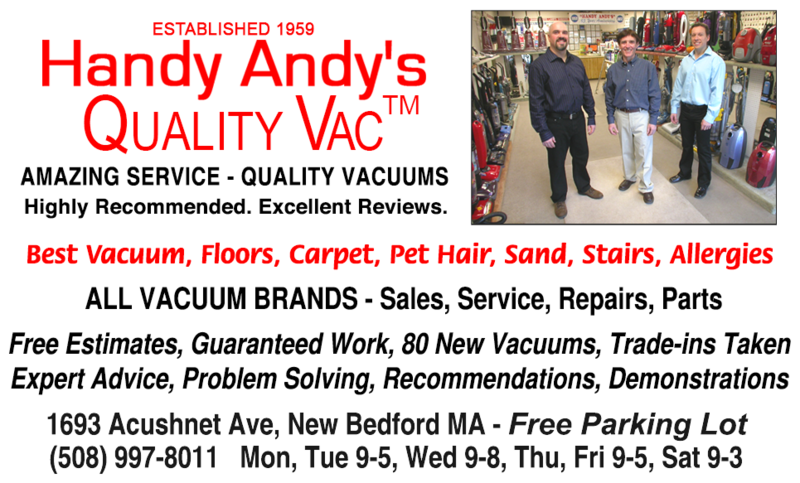 Simply put like our slogan: Handy Andy's Quality Vac™ - Amazing Service - Quality Vacuums - Highly Recommened. Excellent Reviews. Our service is second to none! We repair all brands and carry thousands of parts for all models. We honor the manufacturers warranty on all vacuum cleaners we sell. 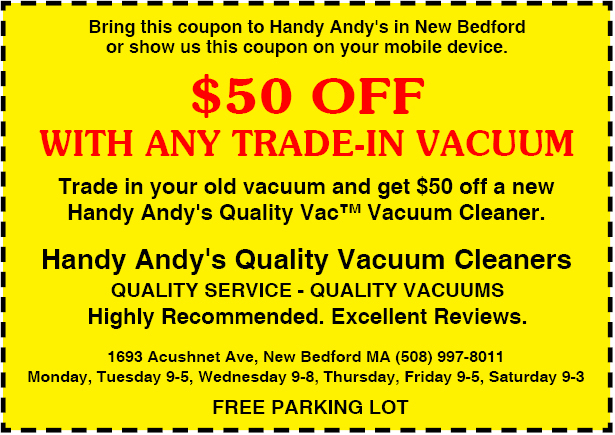 We guarantee and service our own Handy Andy's Quality Vac™ Vacuum Cleaner brand. Find out if your vacuum is worth repairing. We give free estimates and guarantee our work. Our service is fast and we have free loaners to use if you need one. Bring us your broken vacuum and we'll give you a free estimate right away. We carry thousands of new parts for all brands and models! We have all kinds of hard to find filter bags, filters and drive belts. Let us do the service or make the repairs yourself. You can rent a high performance carpet steam cleaning machine or shampooer. We have many machines on hand, expertly maintained and ready to go. Handy Andy's Quality Vacuum Cleaners was established in 1959, founded by Andre J. Champagne and his wife, Irene A. Carrier-Champagne. Andy and Irene built their new business with meticulous detail into one of the areas most respected service companies. The following short history highlights the evolution of Handy Andy's into one of the country's most successful independent vacuum cleaner specialist. After having had varied work experience, including drafting, carpentry, masonry and machining, Andy had taken a job as a sewing machine salesman. However, because he was a skilled craftsman, he soon found himself repairing sewing machines as well. Andy really enjoyed his work as a sewing machine mechanic but he was laid off from his job. This was the beginning of Handy Andy's Quality Vacuum Cleaners. Out of work, Andy had to make ends meet, so he started his own home based business. His wife Irene was very supportive and encouraged her husband to continue developing a full time business despite all the risk. It had now become the family business. Irene was committed to success as much as her husband and helped her husband as much as possible. While at home with 3 children, she was a great help soliciting business by phone while Andy, tool box in hand, was knocking on doors and servicing sewing machines. Andy was a perfectionist and providing amazing service was of paramount importance to him. He quoted one price for his service and worked until it was perfect and never charged extra. Andy knew amazing service never goes out of style and it was no different with repairing sewing machines. It was the key to success and Andy had found his niche. He decided his service would be the best any company ever provided and his repair work completely guaranteed. Andy's guarantee was unprecedented. He guaranteed all his repair work for one year in writing while most service companies only provided at best, a 90 day limited warranty. Together, Andy and his wife Irene decided it was time to open their own store and named it Andy's Sewing Machine Service. The grand opening was May 20, 1959. Irene, or Mrs. Andy as she had come to be known, was the bookkeeper, waited on customers and even made repairs too! Starting a new business and keeping it going is no easy task. Without the encouragement of his wife Irene, mother of five children, and her own devotion and sacrifice for the business and family, would this endeavor have survived the early years. After several years of operation, the business was growing and Andy needed some help. He was very fortunate to have met Edward Guerra, a master mechanic, whose contribution to the company would be so great, it helped propel the company forward for the next fifteen years. Eddie was an exceptionally skilled technician and a true professional. His terrific working relationship with Andy made it possible to expand the scope of the company's services to include repairing industrial sewing machines, restaurant equipment and all kinds small household and commercial appliances. The company was now repairing vacuum cleaners, a whole range of small household and commercial appliances including coffee makers, toasters, flat irons, mixers and electric shavers. A huge stock of special parts was being inventoried to supply hard to find parts and accessories. The company was gaining a reputation for repairing just about anything mechanical, even the occasional umbrella, cuckoo clock, luggage locks or shopping cart. They also provided a sharpening service for knives, scissors, hedge clippers and even ice skates! Andy's Sewing Machine Service had become something much more than sewing machines and at the same time it has never changed. Since the beginning, it has always been about service. They have always provided the best service available anywhere and in many cases, special parts and services not available anywhere else. So you can see why their customers had nicknamed the company Handy Andy's. That's how the company started more than fifty three years ago. Times have changed since then. With home sewing becoming less practiced and many small appliances becoming throw away items, the company had to change too. But Handy Andy's Quality Vacuum Cleaners commitment to product and service excellence has never changed. It's a 60 year legacy of providing the best products and service in the industry. Andy's son, Marc Thomas Champagne, also known as Andy to his customers, is a perfectionist just like his father. He had a newspaper route he gave up at age 11 to work in the family business. Marc worked on a regular basis and was well instructed, conscientious, enthusiastic and very industrious. In 1973, due to his father's illness, he took over the day to day operation of the family business at the age of 17. Following in his father's footsteps, Marc worked with the same commitment and dedication to customer service and satisfaction. While Marc has been in charge for more than 40 years, the focus of the business gradually and completely turned to vacuum cleaners. A consistent, resourceful and innovative individual, Marc perfected the specialization of the company into an extraordinarily unique, vacuum cleaner sales and service organization, and renamed the company Handy Andy's Quality Vacuum Cleaners. Providing constant superb customer service to thousands of customers requires exceptional people. In addition to Marc, President of the company, there are two Vice-Presidents, brothers Henry and Paul who provide extra special care to their customers. These accomplished individuals have been with the company for more than 32 years. The longevity, growth and success of Handy Andy's Quality Vacuum Cleaners is due to the steadfast dedication of these capable executives, their entire first rate customer service staff and the thousands of happy customers they serve.